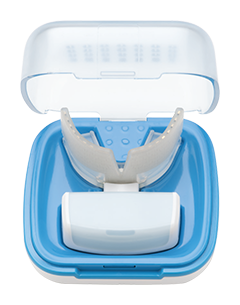 OrthoPulse® is a clinically proven device that uses low levels of light energy to facilitate tooth movement. Just one fast and convenient self-treatment session of 10 minutes per day can accelerate orthodontic tooth movement allowing teeth to move faster. The smart science built into the device is based on a clinically proven and safe technology that has been used in medicine for over 60 years and is documented in over 3,300 published articles. Its elegant design makes it easy and comfortable to use at home or away, while reading or watching TV. There’s no need to change your daily schedule. 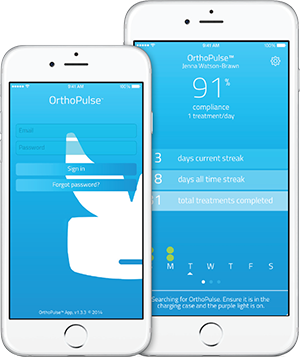 The OrthoPulse® app helps you track your treatment progress and stay motivated. Data from the device syncs wirelessly allowing you to track consistency, daily treatments and overall treatment time. Available for both iOS and Android devices. Over 50% of the light we receive from the Sun is in the near infrared spectrum; we cannot see it, but we can feel it as warmth on our skin. 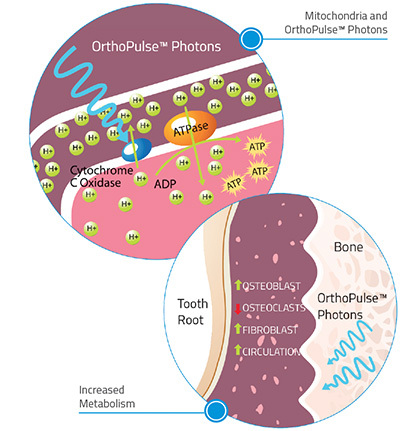 OrthoPulse® uses low levels of near infrared light to gently deliver energy to the bone and tissues around the tooth roots. That energy then helps to remodel the surrounding bone and facilitate tooth movement. The energy contained in the OrthoPulse® light is absorbed by mitochondrial enzymes in cells and converted to chemical energy (ATP).